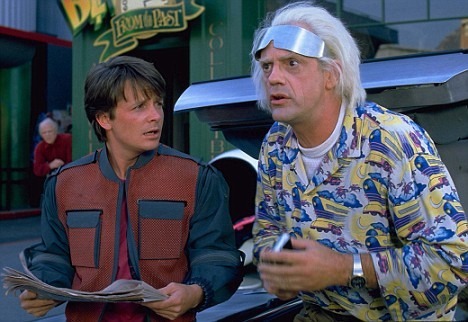 This weekend on the podcast I cover one of my favorite movie trilogies, the “Back to the Future” set of films. This is a great set of movies and one that I have wanted to cover for awhile now. Before I get into the films I cover a quick few bits of news from Sci-Fi and what’s been going on for me. But I don’t spend a lot of time on that as I wanted the podcast this week to have more of the main topic – since I really needed the time to cover the BTTF films. Oh, make sure to always watch the main website here, so you will know what’s coming up on the podcast and can send in comments. Or just comment about a convention or anything related to the genre in movies, TV, books or whatever you would like. Always great to hear from all of you and play your thoughts on the podcast. Then I move on to the “Back to the Future” film coverage on the podcast. I saw all of these in the theaters when they first came out and enjoyed them very much. The first movie especially just has a certain charm and appeal and is unique to this day. The idea of going back in time to see your parents when they were young and in high school is very appealing and a great concept for the film. I spend a lot of time covering the first movie and try to give out some little known facts and details. I enjoyed digging into the background on the early production efforts, scripting and casting too. The whole cast was very well chosen and they all do a great job. It’s hard to imagine anyone else in these parts now – even though Michael J. Fox came on board late in the game (replacing another actor). These films have a lot of heart in them too and there is great chemistry between the characters – especially Marty and the Doc. The films hold up very well I think and are always fun to see again. I hope we get a hi-def version sometime too. I play some of the behind the scenes stuff off the DVD’s and try and give you a little insight into the making of the films. I don’t spend as much time covering parts two and three, but both are great fun to watch too. So, if you haven’t watched these movies in awhile, pull out your discs and spin up the DVD player some night soon. I know you will enjoy seeing them again – or for the first time. Also, thanks Meds for your audio comment for this special show. Always great to hear from you. That was about it for this week’s show. There are some cool paper (printable) props from this movie and I will try and put those up on the forum and in my collectible gallery very soon. So make sure to check that out (and join if you are not yet a member there). And on next week’s show I will be looking at the TOS episode, “The Changeling.” So make sure to tune in again next week. Take care until then!